A yummy, healthy and quick snack is a great find at my house. I don' know about you, but I LOVE popcorn!. It is one of my all time favorite foods and a decently healthy thing to eat. What I don't like is store-bought microwave popcorn. I don't like all the fillers they add (even in the natural and organic ones) and I don't like the slightly metallic taste that it has. 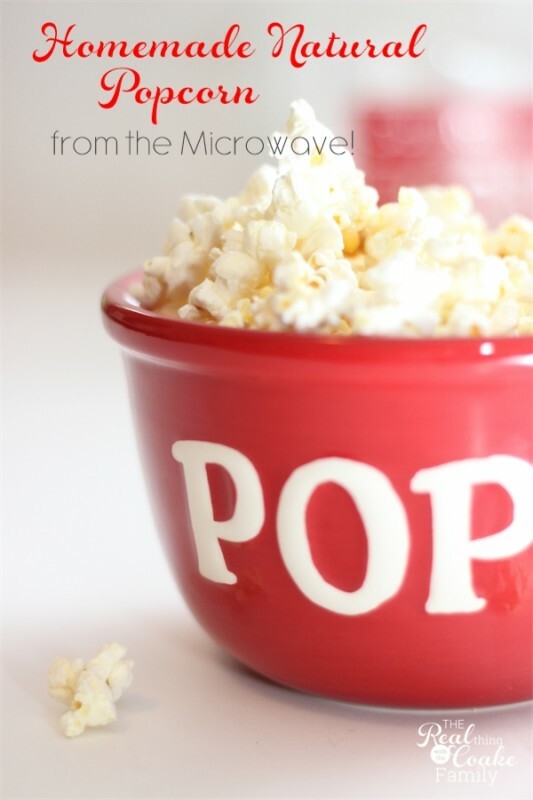 I still like the convenience and speed of the microwave, so for years now I've been making my own organic popcorn in the microwave. I thought it was time I shared my secrets with you. 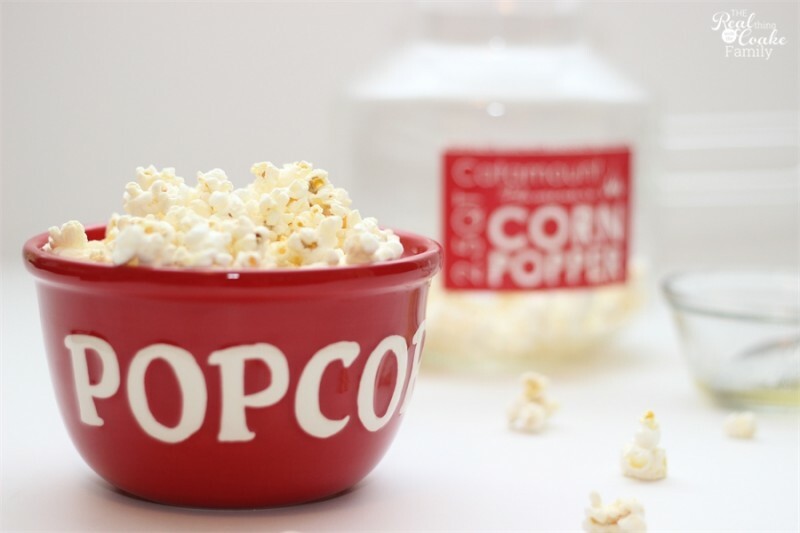 (affiliate link), popcorn kernels (I usually buy the organic ones at Trader Joes for only $2! They were out this week though), butter, and salt. Microwaves will vary, so experiment with the times that work for you. These are the times that work for my microwave. Place 3 tablespoons of the kernels in the popper and place the lid back on. Put it in the microwave for 1 minute 30 seconds on high. Not all of your popcorn will have popped, so scoop out the popcorn that has popped. Place the unpopped kernels in the popper back in the microwave for another 1 minute. I keep my butter sticks in the freezer. That way I never have to worry about them going bad before I use them. I can use a sharp knife and cut off 1 tablespoon at a time. So my times for melting your butter are based on the butter being frozen. If yours is not, your times will be less. Place 1 tablespoon salted butter in a small dish and microwave for 20 seconds. Remove and stir. Microwave for an additional 5 seconds. Next is when the magic happens. 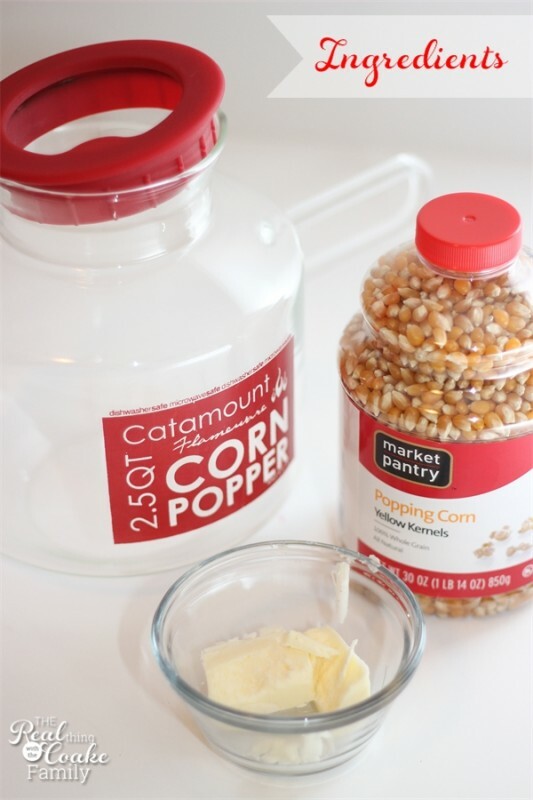 Use a spoon to sprinkle your melted butter onto your popcorn. Add salt to taste. I do this process one spoonful of butter at a time, stirring the popcorn as I go and bringing kernels from the bottom to the top so that all of the popcorn get butter and salt. Yum! Perfectly cooked all natural homemade popcorn. My favorite late night snack! Now all you need is a good TV show or book. Cooking popcorn this way does take a little more effort and time than a bag of microwave popcorn, but I think it is healthier and I also think it tastes tons better. Perfect snack! I didn’t even know you could pop popcorn in the microwave without buying it in bags, that is so neat! Thanks for sharing. Also, I love that it is really made out of glass and not plastic. It is so neat…and yummy! I’ve been making popcorn this way for years. I love the glass no plastic as well. I won’t put plastic in the microwave, so this is a great solution. Glad I could show you something new! Have a great day! 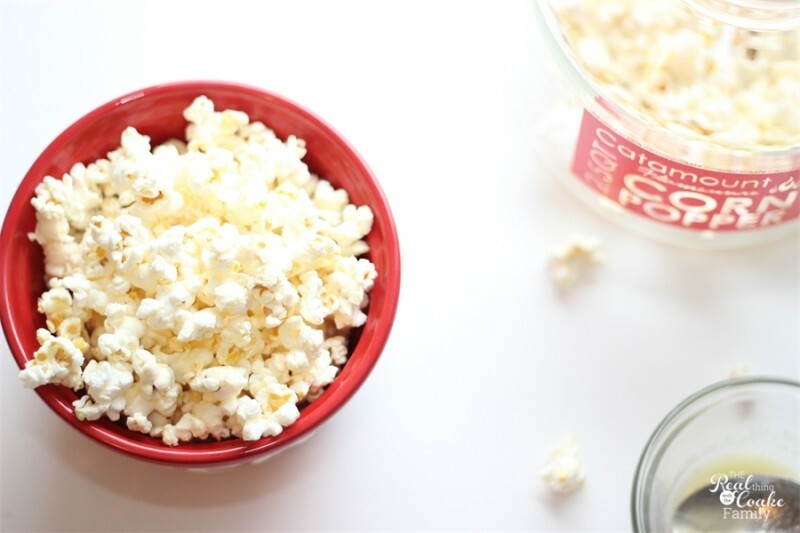 Yes, popcorn and real butter…so yummy! Thanks so much for the shares.